Presentato dalla Compagnia Teatrale "Le Maschere". 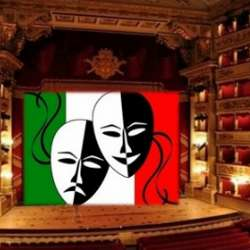 Commedia in due Atti di Gaetano e Olimpia Di Maio. Regia: Angelo Attademo e Giuseppe Sassano. this is the most serious event I can try to organize. Saturday night – Theatre + pizza/dinner. My mother would be proud of me. Just joking :D.
The company “Le Maschere” is presenting a nice comedy entitled “Un napoletnao al di sopra di ogni sospetto”. The representation is going to be in Italian, but I think the contents can be easily understood by everybody. In other words, you don’t need to have a C1 level to join the event. The theater is in Waiblingen. My Idea is to meet Protected content and go there all together. In this way the trip is going to be less boring. 2. Go by car – I have my own car and I can carry up to 4 people (well Protected content + a tiny girl). If we are more than 5, It’s necessary a further driver. Please, let me know in the comment below or through private message how we can arrange the blabla car service. Finally, if you are interested, we could think about having dinner together. Anyways, this is something that can be decide spontaneously just after the theatre.